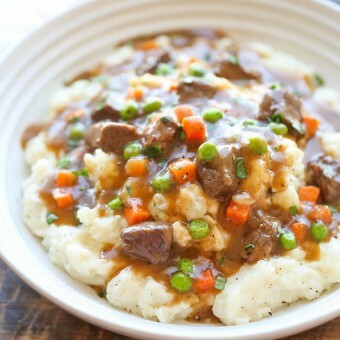 Amazingly slow-cooked tender beef with garlic mashed potatoes – comfort food at its best, and something you’ll want all year long! To make the garlic mashed potatoes, place potatoes and garlic in a large stockpot or Dutch oven and cover with cold water by 1 inch. Bring to a boil and cook until tender, about 15-20 minutes; drain well and return to the stockpot. Stir in half and half and butter. Using a potato masher, mash until smooth and creamy; set aside. Heat olive oil in a large stockpot or Dutch oven over medium heat. Season beef with salt and pepper, to taste. Add beef to the stockpot and cook until evenly browned, about 2-3 minutes; set aside. Add garlic, onion, leek and carrots to the stockpot. Cook, stirring occasionally, until tender, about 3-4 minutes. Stir in tomato paste until well combined, about 1 minute. Whisk in beef broth, beer, parsley, thyme, bay leaf and beef; season with salt and pepper, to taste. Bring to a boil; reduce heat, cover and simmer until the beef is tender, about 90 minutes. In a small bowl, combine butter and flour. Add mixture to the stockpot until thickened, about 2-3 minutes. Stir in frozen peas until heated through, about 1-2 minutes. Serve immediately with garlic mashed potatoes.